Google's Opinion Rewards app is the only official way to get free Google Play credit, which is why so many use it. 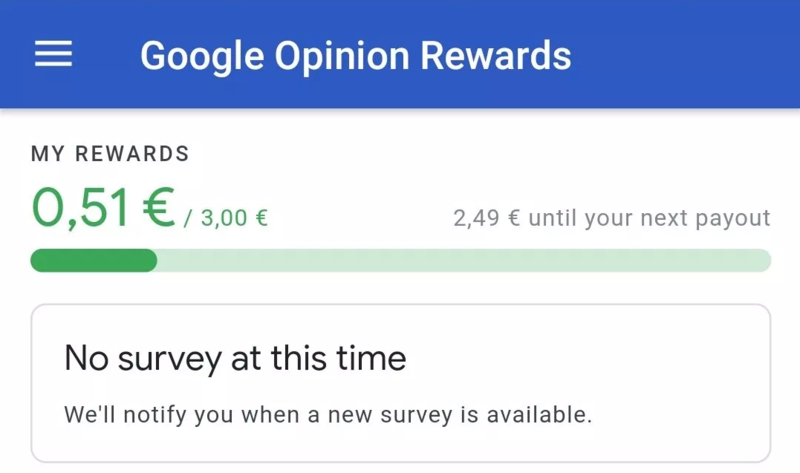 Each survey, which usually only takes a couple of seconds, gives out anywhere between $0.10 and $1, and that can add up quickly with enough surveys. A new, Material-themed interface is being tested, and it looks a lot better than the current UI. We had been tipped about a new look for the 'Reward history' page in Opinion Rewards about a week ago, and it seems like that's available for most. 9to5Google, however, managed to enable a Material Theme for the main page, which adds a nice-looking green progress bar showing how close you are to your next payout. We don't see that here in the US, so I'd assume we'll get this UI, just without the bar. It also removes the random black rectangle surrounding 'No survey at this time,' instead moving that to a rounded box below the progress bar. The 'Reward history' page currently looks extremely outdated with oddly small text, so it's nice to see that the redesign addresses that. There are now counts for the amount of surveys you've done and how much you've earned, and the text can be read by organisms larger than ants. This page's new UI has apparently been around for roughly two months at this point, hence why so many have it already. We're excited to see this redesign arrive on our devices; it's not only easier on the eyes, but more functional as well. It would be nice if this UI officially debuted sooner than later, but knowing Google, we don't want to get our hopes up.